BELMOPAN, Jul 31 2018 (IPS) - By the end of September 2018, the Caribbean Community Climate Change Centre (CCCCC) would have installed the last of five new data buoys in the Eastern Caribbean, extending the regional Coral Reef Early Warning System (CREWS) network as it continues to build resilience to climate change in the Caribbean. At the same time, the centre is also installing an additional 50 Automatic Weather Stations (AWS) across nine countries to expand the existing network of hydro-meteorological stations- yet another push to improve data collection in the region. The data will help scientists to better evaluate potential risks and impacts, and provide the information national leaders seek to build more resilient infrastructures to mitigate climate risks. Enhancing the data collection and availability is central to the centre’s mandate to prepare the Caribbean’s response to climate change, Dr Ulric Trotz science advisor and deputy executive director told IPS. Reporting in “Volume 1 of the Caribbean Climate Series,” released ahead of the 23rd Conference of the Parties of the United Nations Framework Convention on Climate Change in Germany in 2017, researchers at the University of the West Indies Climate Studies Group, Mona Campus, Jamaica, pointed out that the Caribbean is already experiencing the impacts associated with changes in climatic conditions. According to the report, nights and days are warmer; air and sea surface temperatures are higher and there are longer and more frequent periods of droughts. Not surprisingly, after the 2017 hurricane season, researchers also reported increasing intensity in rainfalls and more intense hurricanes with stronger winds and lots more rain. “Even if global warming beyond the 1°C already experienced were limited to only a further half a degree, there would still be consequences for the Caribbean region,” the report said. Trotz explained: “These data gathering systems, which were acquired with funding from the USAID Climate Change Adaptation Programme, are increasing the volume of real-time data and enhancing the reliability and accuracy of weather and climate forecasting in the region”. 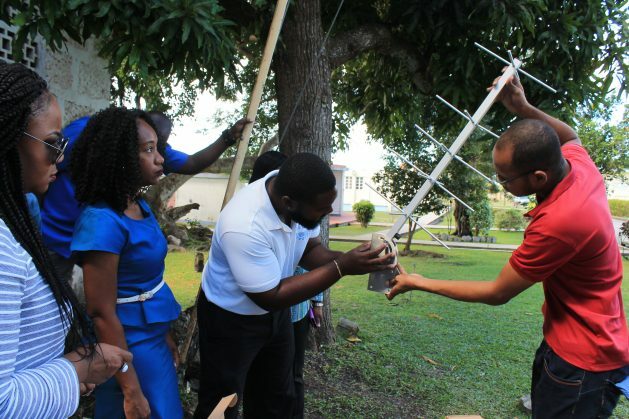 In addition to the super computers installed at CCCCC’s Belize location, the University of the West Indies’ Mona Campus and Caribbean Institute for Meteorology and Hydrology (CIMH)-under previous projects- the newly installed data points, are already enhancing the capacity of regional scientists to monitor and process the atmospheric and other environmental variables that are affected by the changes in climatic conditions. The data collection efforts support evidence-based decision-making, and improve the accuracy of the projections from the regional and global climate models while building the region’s resilience to the impacts of climate variability and change. In the end, the information provided in the 1.5 Report which will form part of Intergovernmental Panel on Climate Change global assessment report AR6 as well as all other Caribbean forecasts and models promises to be more accurate and reliable. “The data collected from these stations forms the baseline for all climate modelling, ensuring that we have a good baseline data to suffice our regional climate services models for regional forecast and predictions. The network strengthens the baseline for climate change projection models thereby increasing the confidence in the results that are used in the decision-making for climate change mitigation and adaptation,” Albert Jones, instrumentation technician at the 5Cs, told IPS. The retired weather forecaster explained, that the new AWS are not only improving data collection, they are also expanding the capability and roles of local Met Offices from their historic roles of providing information for primarily aviation purposes. The importance of these systems cannot be understated, particularly in countries like Guyana and Suriname where deficiencies in the data seriously hampers the coverage of areas with significant differences in the topography and climatic conditions. This is especially significant where comparisons of hinterland and elevated forested areas to the low-lying coastal flood plains are critical to development of lives and property. The centre, which celebrates its 14th year of operation in July 2018, has worked with several donors over its existence to improve the collection of data in a region that largely depended on manual systems and where historical data has been hard to come by. The latter is an essential input for validation of the regional models required for the production of region-specific climate scenarios, which are utilised in impact studies across all of the affected sectors in the region. These in turn form the basis of crafting the adaptation responses required to build climate resilience in specific sectors. Popularly known as the 5Cs, the climate change centre carries out its mandate through a network of partners including government meteorologists, hydrologists, university professors and researchers. Scientists and researchers in Universities across the region and at specialist institutions like the Barbados-based CIMH, do the data crunching. “We are building climate and weather early warning systems to build resilience, so it is important that we collect and turn this data into useful information that will benefit the society,” CIMH’s principal Dr David Farrell told hydro-met technicians at a USAID sponsored training on the grounds of the institute in March. He noted that in designing the system, the CIMH- that has responsibility for maintaining the network- identified and reduced existing deficiencies to improve the quality of data collected. With studies pointing to a warmer Caribbean and an increase in the frequency of extreme events, regional scientists are committed to improving the way they use data to guide governments on the actions that will lessen the expected impacts. In 2017, extreme weather events in the form of Hurricanes Irma and Maria claimed lives, destroyed livelihoods and infrastructure, throwing islands like Barbuda, Dominica and the Virgin Islands back several decades. The CREWS network is part of a global system to improve the monitoring and management of coral reefs as environmental and climatic conditions increases coral bleaching and death. The centre works in collaboration with the National Oceanic and Atmospheric and Administration to install monitoring stations that collect data on climate, marine and biological parameters for use by scientists to conduct research into the health of coral reefs in changing climatic and sea conditions. Under previous funding arrangements, CREWS stations were also installed in Belize, Barbados, Jamaica, Trinidad and Tobago, the Dominican Republic, as well as other parts of the region.